(Nanowerk News) Drexel researchers, along with colleagues at Aix-Marseille University in France, have discovered a high performance cathode material with great promise for use in next generation lithium-sulfur batteries that could one day be used to power mobile devices and electric cars. Lithium-sulfur batteries have recently become one of the hottest topics in the field of energy storage devices due to their high energy density—which is about four times higher than that of lithium-ion batteries currently used in mobile devices. One of the major challenges for the practical application of lithium-sulfur batteries is to find cathode materials that demonstrate long-term stability. An international research collaboration led by Drexel’s Yury Gogotsi, PhD, Distinguished University and Trustee Chair professor in the College of Engineering and director of its Nanomaterials Research Group, has created a two-dimensional carbon/sulfur nanolaminate that could be a viable candidate for use as a lithium-sulfur cathode. Drexel University materials researchers have created a material from MAX Phase etching that could be a good candidate for cathodes in Lithium-Sulfur batteries. In a paper they recently published in the chemistry journal Angewandte Chemie ("Synthesis of Carbon/Sulfur Nanolaminates by Electrochemical Extraction of Titanium from Ti2SC"), Gogotsi, along with his colleagues at Aix-Marseille University explain their process for extracting the nanolaminate from a three-dimensional material called a Ti2SC MAX phase. Their paper was selected as a VIP article and will be featured on the journal cover. The MAX phase, which is one of a family of layered ceramics discovered two decades ago by Michel Barsoum, PhD, Distinguished professor in Drexel’s Department of Materials Science & Engineering, has been used as the basis for much of Drexel’s materials research intended to find better materials for batteries. The researchers found that carbon/sulfur nanolaminates have covalent bonding between carbon and sulfur and an extremely uniform distribution of sulfur between the atomically thin carbon layers. This structure is key to their potential for being used as electrode materials for lithium-sulfur batteries. 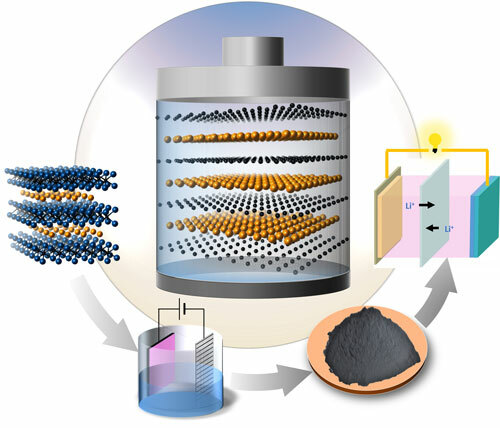 Currently, sulfur infiltrated carbon nanomaterials have demonstrated to be the most promising cathode materials for Li-S batteries. In these materials, the uniform distribution of sulfur in carbon matrix and the strong interaction between carbon and sulfur are two important factors that affect the performance. The carbon/sulfur nanolaminates synthesized by Gogotsi’s group demonstrate the same uniformity as the infiltrated carbon nanomaterials, but the sulfur in the nanolaminates is uniformly deposited in the carbon matrix as atomically thin layers and a strong covalent bonding between carbon and sulfur is observed. This may have a significant impact on increasing the life-span of next generation batteries. “We have enough evidence to show that that the electrochemical etching can be a powerful method to selectively extract the ‘M’ elements from the MAX phases, to produce a variety of ‘AX’ layered structures, that cannot be made otherwise,” said Meng-Qiang Zhao, Gogotsi’s post-doctoral associate and the lead author on the paper. This is a significant discovery, because there are more than 70 MAX phases in known existence. Gogotsi estimates that odds are with the MAX phase’s new “AX” progeny becoming the materials that find use in next-generation electrical storage devices.